Successive Golden Rectangles dividing a Golden Rectangle into squares (logarithmic spiral known as the golden spiral). Chimbote is the largest city in the Ancash Region of Peru, and the capital of both Santa Province and Chimbote District. The city is located on the coast in Chimbote Bay, 260 mi north of Lima. The territory that now stands on Chimbote has been populated by cultures Moche, Wari, Recuay, Chimu and Inca. In Chimbote you can visit the archaeological sites of Punkuri, Panamarca, Huaca San Pedro, El Castillo, and San Jose de Moro, among others. Source: Wikipedia: Chimbote. 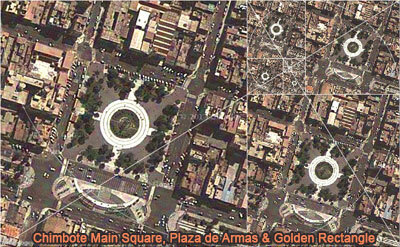 Nuevo Chimbote, Main Square, Plaza Mayor, Stereographic Projection.